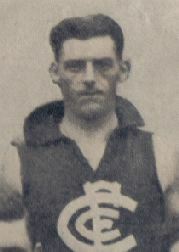 Johnson played 29 games for Carlton commencing in Season 1927. He kicked 13 goals for the Blues. A big man and follower, Les was a personal friend of Horrie Clover. Johnson was both born, and recruited from Maryborough. Les' son Jack played wih Fitzroy thirds and in the seconds in 1954. He did not play in the seniors. Contributors to this page: blueycarlton , Bombasheldon , molsey , tmd1 , dgreen2 , WillowBlue and admin . Page last modified on Wednesday 27 of March, 2019 10:37:35 AEDT by blueycarlton. 1985 Rd 17 - Justin Madden wins another centre hit-out. 1964 - Sir Kenneth Luke.